(VACNE) - On the occasion of the 30th anniversary of the establishment of VACNE, the relevant agencies will organize the Journey of the Environmental Cycling linking the Heritage Trees in 2018. Please post information about volunteer recruitment of the Organizing Committee. 2018 is the 30th anniversary of VACNE. On this occasion, VACNE collaborated with the Environmental Cycling Club along with some students from the universities to organize the Cycling Connecting the Heritage Trees in 2018. 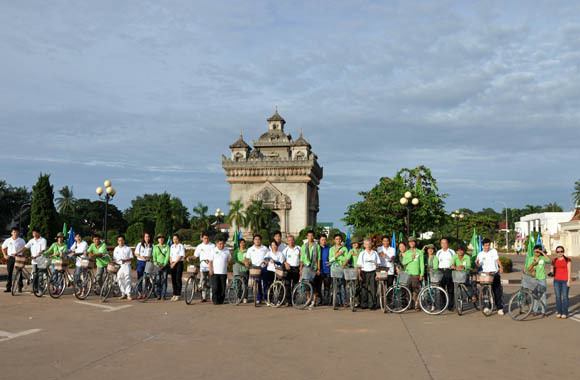 By bike, the journey of 30 members in 23 days will travel through 11 provinces and cities in the North with local attractions and heritages. In addition to organizing the media at the start and end of the journey, along the itinerary, there will be press highlights of the volunteer mission with the local community to call for community protection. heritage, tourism promotion of the local and environmental protection. We are looking forward to receiving and registering for students' attendance at universities, colleges and vocational schools in Hanoi. 2.1. Target: Young people, students are studying at the college, university, vocational training in the city of Hanoi. - Have time and conditions to participate during the journey. - Priority is given to students who register early and have participated in volunteer work. - Take part in cycling along the journey, attend the launching ceremony, the closing ceremony and special communication events within the framework of the program.- Giao lưu với cộng đồng địa phương tại các điểm hành trình đi qua. - Report to the head of the incident for guidance and support for handling. - Ensure the scheduled time for participation and notification of the delegation head. - To be provided with food, drink and refreshments according to the regulations of the Organizing Committee. - To be allocated the costume of the program (shirt, hat, flag). - Be trained before joining the program.- Be granted a certificate after the end of the program; Updated information on the resume of the individual.